Sinn Féin has condemned the tactics used by KBC in repossessing the property. AN TAOISEACH LEO Varadkar has condemned a “highly organised, highly violent” attack on a repossessed house and farm in Falsk, Co Roscommon, which left eight people injured over the weekend. 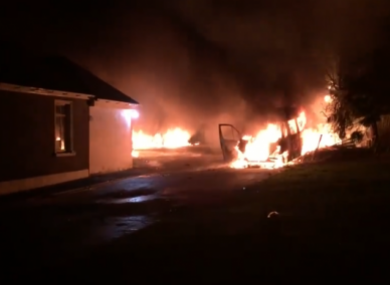 A number of vehicles were set alight during the intrusion which took place in the early hours of Sunday morning. Three of those attacked required hospital treatment in the aftermath of the incident. A guard dog was also seriously injured and had to be put down as a result. It is understood that the house and farm was repossessed last week and security personnel were guarding it at the time of the attack. RTÉ is reporting that a member of the family that was evicted returned to the house this evening. Speaking to RTÉ News Varadkar said he is “very concerned” by the details of the incident that have emerged in the last couple of days. “I don’t know the individual circumstances as to how this came about and I don’t think anyone likes to see anyone being evicted or losing the property that they’ve held, particularly in the run up to Christmas, but if it was done on the basis of a court order I can only assume that the judge heard all sides of the story and made the decision that he did,” he said. But leaving that aside, leaving aside the reasons for the eviction, I think all of us have to condemn, unreservedly, the use of violence. In this instance individuals being injured. An animal was killed, property destroyed. And it would seem that it was a highly organised, highly violent, vigilante attack and that’s something that, I think, it behoves all of us to condemn without reservation. RTÉ also shared drone footage showing burned-out vehicles at the property near Strokestown. Varadkar’s comments were echoed by the Minister for Justice, Charlie Flanagan, who said that it is important that the Garda investigation can take its course. “While I do not wish to comment on any individual case, I wish to stress that violence is never justified. An Garda Síochána are the sole legitimate guardians of the peace in this State, charged with upholding the law in the interests of the whole community,” he said. I am deeply disturbed by the thinly veiled references to vigilantism that have been made in recent days in social media and elsewhere. This is a very dangerous road to go down and vigilantism cannot and will not be tolerated in this State. The minister added that the full facts of this particular case are not in the public domain. Meanwhile Sinn Féin Finance spokesperson Pearse Doherty has said that the tactics used by KBC bank in repossessing the property were “unacceptable and intolerable”. “I was shocked at the video footage from Roscommon showing the aggression and violence perpetrated in enforcing an eviction order. KBC Bank is responsible for this eviction and must be held to account. I have written to the Oireachtas Finance Committee calling for KBC and their agents involved in this eviction to appear before the Committee,” Doherty said. Public anger is rising at the constant Fine Gael and Fianna Fáil enabling of banks, these modern day bailiffs, and the vulture funds to act as they like. “The immediate issue lies with banks employing security firms with no accountability to evict working families. Those banks should cease these operations and resolve their cases through the many, many other avenues open to them,” he concluded. Email “Taoiseach condemns 'vigilante' attack on repossessed farm house in Roscommon”. Feedback on “Taoiseach condemns 'vigilante' attack on repossessed farm house in Roscommon”.